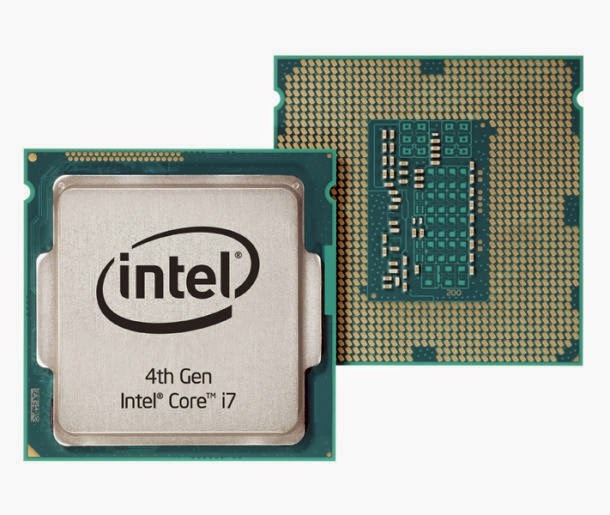 The Core i7-4700HQ is another high-end processor manufactured by Intel. It is a quad-core processor based on the Haswell architecture and fabricated using 22 nanometer technology. It features Hyper-threading which makes the four cores to handle up to eight threads in equivalent which leads to better operation of the CPU. Each of the core of this Intel Core i7-4700HQ quad-core processor offers a base clock speed of 2.4 GHz but because of Turbo Boost technology it can increase clock speed up to 3.2 GHz when 4 of the cores are activated, 3.3 GHz when 2 of the cores are active and 3.4 GHz when 1 of the cores is active. This powerful processor, Intel Core i7-4700HQ which is based on Haswell architecture has 256 kB level 1 cache, 1MB level 2 cache and 6MB level 3 cache. In addition, new interesting features like AVX2 and FMA is expected to improve the performance in future applications. In terms of performance, Intel Core i7-4700HQ quad-core processor is somewhat quite powerful than older Ivy Bridge processor with similar clock speed because of its architectural enhancements. This processor has a PassMark rating of about 7958, this is quite lower compared to Intel Core i7-3740QM processor with a PassMark score of 8459 but higher than Intel Core i5-4210U with a score of 3521 and Intel Core i3-3217U with a score of 2299. 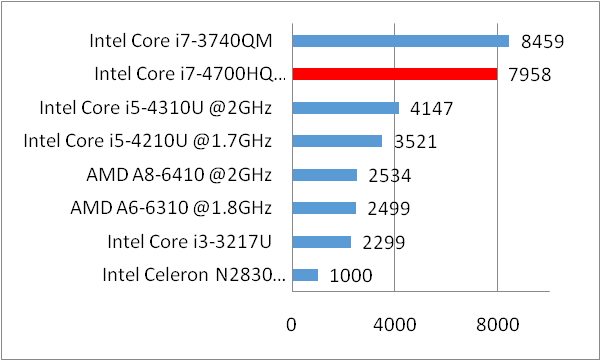 Below is a graph showing the PassMark score of selected processors. The Intel Core i7-4700HQ quad-core processor is equipped with integrated graphics controller dubbed Intel HD Graphics 4600 which offers 20 Execution Units which clocked at 400 MHz up to 1200 MHz because of Turbo Boost feature in the graphics side, this makes it about 30 % quicker than the older Intel HD Graphics 4000. This Intel Core i7-4700HQ quad-core processor has a thermal design power of 47 Watts, this includes the integrated graphics card, memory controller and VRMs. With this, this processor is designed for laptops with sizes ranging from 15-inches or greater.